For those folks who had hoped that Volkswagen would bring back the Beetle as electric, the automaker has a one-word answer: No. That’s it no, nada, fine, done, rien, or nope. For the record, the automaker is ending a more than seven-decade run on one assembly line of another of the Volkswagen Group. According to Volkswagen, production of the iconic rear-engined series will end later this year. 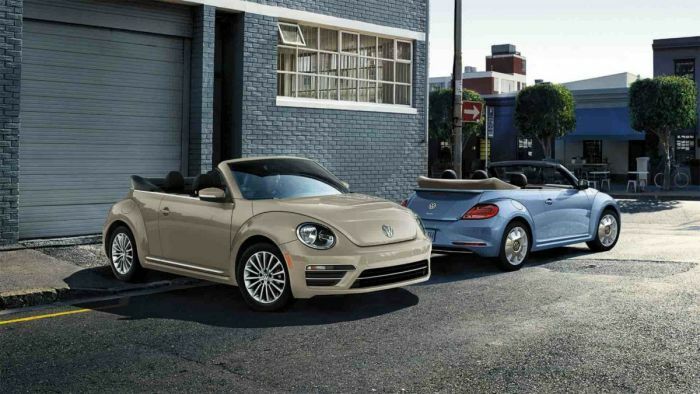 The Beetle has been produced nearly continuously for more than 70 years. The prototype debuted in 1946. The “Bug” has continued nearly unchanged during its run. The changes that occurred have been “under the hood.” Volkswagen has long prided itself on improving its products. Over the years, the improvements have been mostly “under the hood” or “under the skin” so they were not immediately visible. The changes have consistently made the product better. As the Beetle winds down, Volkswagen has introduced the Beetle Final Edition SE. It will be the last internal combustion Beetle, VW confirmed recently at the 2019 Geneva Motor Show. The automaker also said there would be no revival electric vehicle with the Beetle name. The information came from an interview between Motor Trend editors and VW CEO Herbert Diess. At first, it seemed as if the Beetle might have had a future as electric, with Diess seemingly giving tacit agreement. However. Almost immediately, though, Diess shutdown the idea of an electric VW “Bug” because of its conventional platform and “emotional” issues. Diess noted that the Beetle was self-limiting in the vehicles that can be built using it. He noted that the MQB platform, which underpins the 30 or so electrics that will be rolling out of VW assembly plants in the next three years or so, offers lots of design freedom. He pointed to the flat floor which offers designers lots of room. He pointed to the I.D. family; For example, the flat floor gives designers room. If, they were to have used a more standard platform, like the one under the Beetle they, designers would have been limited. Diess affirmed that by using a flexible platform like the MQB, the automaker would be able to roll out the many electrics promised by 2025. The automaker has promised 27 vehicles by then. The MQB offers VW is a more flexible structure than the one used in the Beetle. Diess pointed to the I.D. Buzz as a vehicle that has benefited from the design freedom allowed by the flexible platform. Diess also noted that the platform also makes it easy to do many different vehicles while controlling things. Diess also noted there is an emotional element to its offerings, one that has to do with looking back fondly to vehicles of the past that hold a special place in the lives of many drivers. That is why the automaker chose Geneva to debut its new dune-buggy-style car– not a Beetle. The dune-buggy-style electric, christened the I.D. Buggy, harkens back to the dune buggies (quite possibly the VW Thing) of the 1960s and early 1970s. They were minimalist vehicles, but many drivers had fun in them. Again, Diess was adamant when he asked if the Beetle had a chance at another revival. “No, you have to do something emotional but I think we can’t cover the historic lineup of Volkswagen with electric cars, and we shouldn’t.” The automaker acknowledged the emotional model for the next little while will be the I.D. Buggy, an unabashed look at the dune- buggies of the past. I think that it is a bit of a cop out for VW. They are building a VW Bus (Buzz) and Dune Buggy (which wasn't even a VW idea, they just used the common Bug chassis), so I seriously doubt that building the EV Bug would be hard to do. The excuse that they do not want to retrofit the Beetle chassis with an EV drivetrain is weak. Of course a new EV Bug would be built on a MQB EV chassis, but it is likely that VW is just following the trend of building CUV/SUVs, and they are safe designing an impractical dune buggy concept because it will most likely never get built, but an EV Bug would need to have the space for people, batteries, and stuff, which the rounded Bug body is less efficient at compared to your average box vehicle. Plus I believe the bigger issue that VW is avoiding is that the Bug was known for decades as being very affordable (read cheap) transportation, which flies in the face of future profits. The New Beetle was really just a rebodied Golf, with it's FWD, front mounted, water cooled engine and all. And it was a sales success because it rode the wave of retro designed cars from the Thunderbird to the Mustang, Challenger and Camaro, plus the Mini and Fiat 500. But that retro trend has flattened as most new designs lean towards bloated SUVs and many automakers are dropping their sedans, coupes, economy and sports cars.